The Bold and the Beautiful spoilers tease that summer will bring some fresh starts for Wyatt (Darin Brooks). Wyatt is really in need of some positivity in his life right about now. He’s been through some major drama as the one who interrupted Liam (Scott Clifton) and Hope’s (Annika Noelle) wedding, and he’s been disowned by Bill (Don Diamont). Wyatt’s unfortunately had drama in his relationship with Katie (Heather Tom), too. Katie heavily pressured Wyatt to keep Bill’s lies and deception regarding Steffy (Jacqueline MacInnes Wood) a secret so that Liam would marry Hope. Things just haven’t been the same for Watie since all that went down, and B&B spoilers say that they’ll be taking a good hard look at their relationship soon. At about the same time that happens, Wyatt is going to connect with someone new who may be a breath of fresh air for him. The Bold and the Beautiful spoilers say that Wyatt and Sally (Courtney Hope) will bump into each other at The Bikini Bar. Sally will have just broken up with Thomas (Pierson Fode) and returned to Los Angeles after her time in New York, so she’ll probably be looking for a friend to commiserate with. Wyatt will probably be happy to listen to Sally’s problems – it will be a nice distraction from the heaviness that he’s experiencing with Katie right now. Plus, Wyatt has been spending too much time moping around lately and wallowing in his own issues. Maybe he’ll get a fresh perspective from Sally. She’ll probably be sympathetic to Wyatt’s problems with his father, too, since Sally has had her own issues with Bill. A new friend is just what Wyatt needs, and Sally seems to be perfect for him. She’s about his age, she isn’t tied down with a child like Katie is, and she could bring a positive energy to Wyatt’s life. She and Wyatt could have a nice, carefree summer romance that could lead to more. They seem like a great pair! 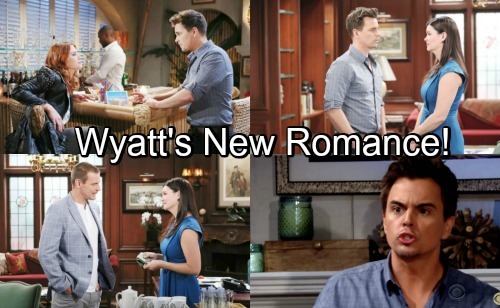 Are you excited to see Wyatt interacting with someone new? And will Sally light up his life? Stay tuned to the CBS soap and don’t forget to check CDL often for the latest Bold and the Beautiful spoilers, updates, and news.